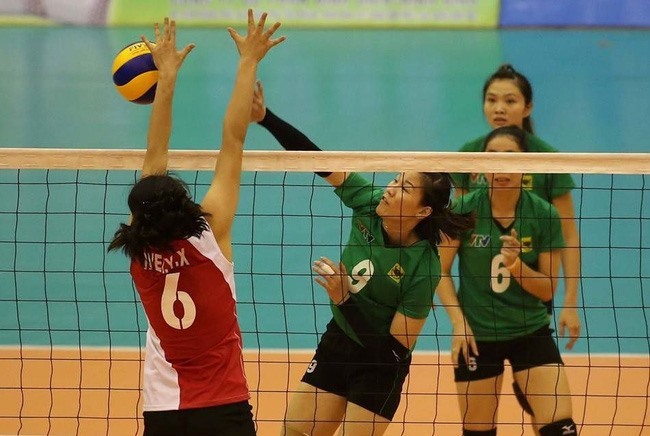 HÀ NỘI — China’s Yunnan Club are the first team to enter the semi-finals of the International Women’s Volleyball Tournament, VTV9-Bình Điền Cup, after their second win yesterday in Tây Ninh Province. Yunnan defeated host VTV Bình Điền Long An 25-19, 25-15, 13-25, 25-23 in Group A. It was their second win here. Previously, they beat Lienviet Postbank 28-26, 23-25, 26-24, 28-30, 15-10. In the earlier match of the group, Lienviet Postbank trounced Altay Club of Kazakhstan 25-19, 25-11, 25-18. Lienviet Postbank and VTV Bình Điền Long An will meet each other tomorrow. The winner will secure the second semi-final ticket.